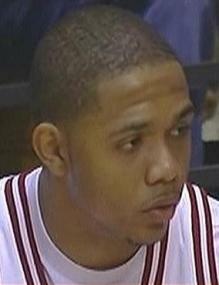 Eric Gordon scored 31 points and held Osiris Eldridge to seven points to lead No. 8 Indiana past Illinois State 70-57 Friday night in the Chicago Invitational Challenge at the Sears Centre in Hoffman Estates, Illinois. Gordon shot 11 of 18 from the field and 7 of 10 from the foul line. He had 20 points in the first half. More importantly, he held Eldridge to 14 points below his season average. Eldridge shot just 3 of 11 from the field. As Gordon alluded to, the game was much closer than the final score indicated. The Redbirds (3-1) cut the Indiana lead to two at 50-48 with 10:27 remaining on a layup by Anthony Slack. Slack was fouled on the play but missed a free throw that would have cut the lead to one. Illinois St. never got any closer and the Hoosiers (4-0) closed the game on a 20-9 run. Jordan Crawford came off the bench and was the only other Hoosier in double figures with 13 points. D.J. White struggled to find his groove and finished with just four points on 2 of 7 shooting. Armon Bassett left the game with just over a minute left in the first half with an apparent foot injury and did not return. Levi Dyer led Illinois State with 18 points. Slack finished with 13. Indiana will conclude play in the Chicago Invitational Challenge Saturday evening at 8:30 against Xavier. Where is it documented that Basset is in the hospital? I’ve had a couple of e-mails asking about Armon Bassett’s injury. At this point, all I know is what Coach Sampson said after the game. Armon’s status for tonight is unknown. I’m sure we’ll know more later today but I would not jump to any conclusions at this point. Did anyone else notice that when Crawford was running the point only about forty percent of the time he passed it before he got stopped. Half of our possessions consisted of Crawford starting spin moves from the top of the key until he threw up an unsolicited fade away or was bailed out by the officials. I was frustrated with his play the entire second half. I think Crawford is a good player but he is too concerned about his points and it hurt the team tonight. Let EJ take it down the court, he seems to know where other people are on the court. After that half I really hope Bassett is back soon. Steve I think that is what KS wanted given the guy guarding him was 5-7ish. I saw that but quickly figured out it was a matchup KS was trying to exploit…I don’t think there offense is a 1 on 1 contest. At one point he had EJ do the same thing in a 1-4 set….hell DJ was no help last night so I will take what I can get. Missing 5 open Threes is not what I call holding someone to 7 pts. As the case was when Gordan guarding Osiris Eldridge.